This past Sunday I met up with Steph (my former coworker who is back in Japan!!) and we hit up some new spots in the city. It was such a chill afternoon filled with strong coffee, good food, and a cool breeze. The chill vibes were exactly what I needed. First stop - AFURI. One of the best bowls of ramen you will get in Tokyo. The soup is yuzu (citrus) flavor and the thin noodles paired with the fatty pork is an insane combo. Afuri is the one bowl of ramen I will consume in it's entirety!! Literally...drinking every drip of soup! We also went to the OG AFURI shop in Ebisu which is just a narrow restaurant with about 20 seats lining the counter. You pay on a vending machine and hand your ticket to the chef. After lunch we walked over to Daikanyama and then caught the train to Jiyugaoka...a suburb outside Shibuya. It's known as the little Italy of Tokyo...and lives up to it's name with tiny cozy streets and a lot of fancy bakeries. 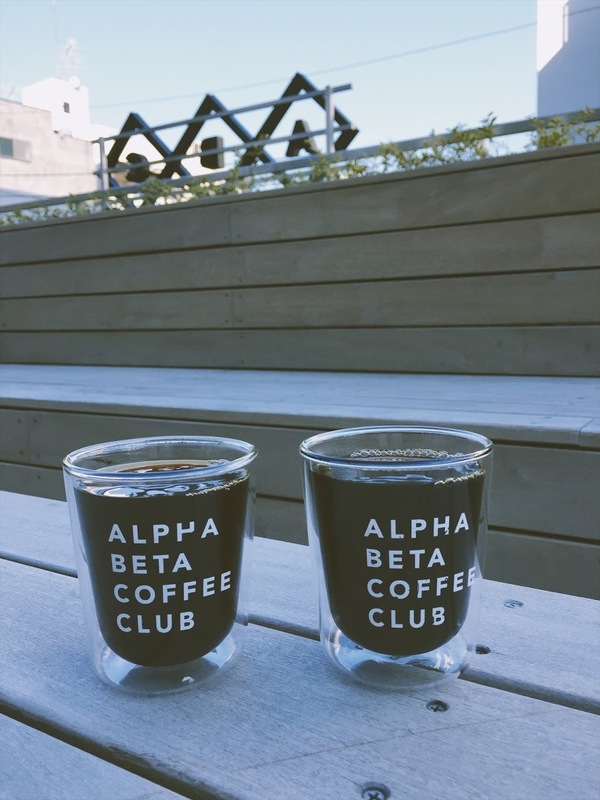 Steph showed me this dope coffee shop called ABC which had hand drip coffee in double layered clear mugs and a wooden patio out back...uhhh hello perfection. From Jiyugaoka, we had to head back to Shibuya anyway...so we stopped by this new hotel that opened called HOTEL KOE. We had both seen photos of it on insta and wanted to check it out...and WOW. It was the definition of Tokyo chic. There was a coffee shop/restaurant right in the main lobby...paired with a clothing store on the second floor and the hotel rooms upstairs. Tokyo is always pushing the envelope when it comes to hip, trendy things and this was no exception. I love finding these pockets of inspiration in the big city. I is so nice to have Steph back in Tokyo (she'll be teaching at a University) and we picked up right where we left of...chillen out in the city!! -SPRING IS HERE!! Theres are only a few more cold days on the calendar before the warms comes for good...and everyone is stoked. -Graduation is in two days! WOW. This year is going to be really special, since I've known these graduating seniors since they were 1st year students and I was the new teacher from the states. Bring on the tears!! -I told myself i'd read at least one book a month this year (achievable goals, you know!) and I am proud to say I am on my 4th book. So far i've read...THE BOOK THIEF, THE SYMPATHIZER, THE HANDMAIDS TALE, and now i'm on to my next! Feels good to read again. -I am currently listening to Kpop playlists on REPEAT and can't stop. The beats are just so catchy!